"Once Upon a Fortnight," an original student written musical, was a perfect blend of crime, comedy, and music. A murdered mayor, a detective team made up of a police commissioner and a professor, an unusual love story, and a ‘missing’ relative. 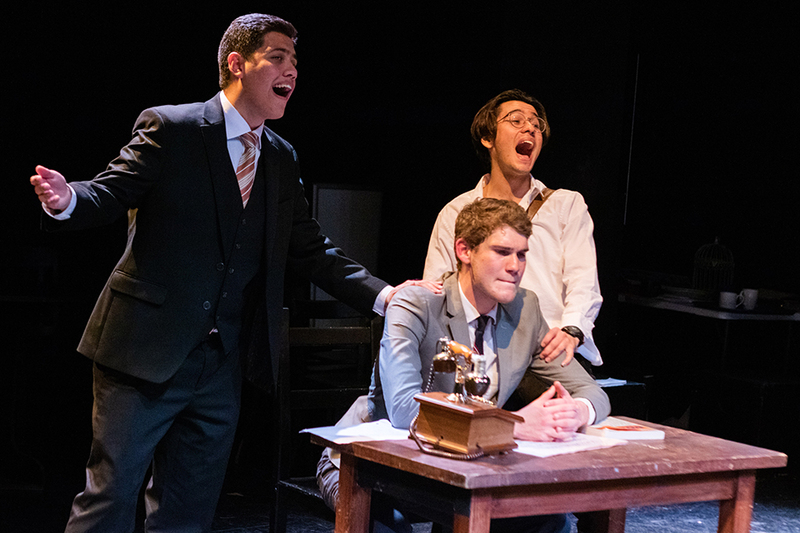 This was “Once Upon a Fortnight,” a creative and well-thought-out neo-noir musical comedy written by David Treatman, JTS/GS ’20 and Brent Morden, CC ’19. Between Friday, Nov. 9 and Sunday, Nov. 11, Hillel’s The Pale Blue presented the world premiere of the original musical “Once Upon a Fortnight” at The Black Box Theatre in Columbia’s Lerner Hall. The two-and-a-half hour production was set in “smoky jazy metropolitan New York of the 1980s” and was a perfect blend of crime, comedy, and music. The musical begins in New York City soon after the murder of a Mayor Silverman. Former partners Bruce J. Fort, Reuben Rahmeyer, SEAS ’21, and Gordon Fine, Robert Willard, CC ’20, reunite in an attempt to solve the case. To that end, Fine also recruits two interns, Judy, Alexandra Kapilian, CC ’20, and Rudy, Jonathan Kapilian, SEAS ’20, as well as his love interest, Misty, Michelle DiMaggio-Potter, CC ’20. Unknown to the detectives, they are all the while being manipulated by Fort’s secretary, who turns the investigation into one big imbroglio involving love, deceit, and kidnapping. By mixing noir with comedy, the writers set out to create something refreshing and novel. Through gestures including eye contact and handshakes, the 11-member cast consistently engaged with the audience. Such unexpected acts left members of the audience surprised and perhaps slightly uncomfortable, but added to the comic nature of the show. From the gold antique phone on the police commissioner’s desk to the pencils in the waitress’s hair, it was clear that the props were punctiliously chosen to add to the atmosphere of the musical. The idea of extras in diner scenes obstructing their faces with faux New York Times papers was particularly brilliant. These scenes were very dimly lit with spotlights focusing on the ever-changing newspaper headlines, a stylish way of informing the audience of happenings as the story unfolded. In addition, the show paid homage to the ongoing societal fight for gender equality. While the two male detectives initially took center stage, the female character, Connie, excellently played by Isobel Obrecht, BC ’22, was at the nexus of the twist ending. Moreover, the character Judy, a female intern detective, was firm in her demand for equal treatment from her boss with the words: “If I am going to be part of this team; you need to treat me like an equal.” Judy, a melodramatic character portrayed by the expressive Kapilian, played a crucial role in solving the murder. Brent Morden, the musical director of Columbia’s jazz a cappella group Uptown Vocal, was the talent behind the jazzy music of the show, constantly in tune with the moods of the different scenes. Yet for Morden, the musical was more than just the music and laughter—he hoped that people would learn from it. The Pale Blue definitely achieved Morden’s aims. Nearly every scene presented the audience with a new complex adventure, successfully pairing the comedic and the compelling.